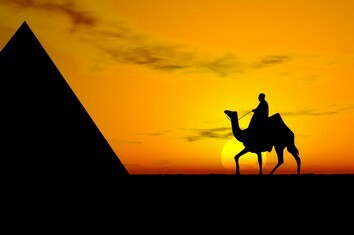 Egypt is one of the most populous countries in Africa and Western Asia. The great majority of its estimated 76 million live near the banks of the Nile River, in an area of about 40,000 square kilometers (15,000 sq mi), where the only arable agricultural land is found. The large areas of the Sahara Desert are sparsely inhabited. About half of Egypt's residents live in urban areas, with the majority spread across the densely-populated centres of greater Cairo, Alexandria and other major cities in the Nile Delta. Egypt is a shopper's paradise - especially if you're interested in Egyptian-themed souvenirs and kitsch. However, there are also a number of high quality goods for sale, often at bargain prices. En faisant des emplettes dans les marchés ou faire face à des vendeurs de rue, n'oubliez pas de marchander. Egypt does not receive much rainfall except in the winter months between October and March. Snow falls on Sinai's mountains and some of the north coastal cities such as Damietta, Baltim, Sidi Barrany, etc. and rarely in Alexandria, frost is also known in mid-Sinai and mid-Egypt. Temperatures average between 27 °C and 32 °C in summer, and up to 43 °C on the Red Sea coast. Temperatures average between 13 °C and 21 °C in winter. A steady wind from the northwest helps hold down the temperature near the Mediterranean coast. The Khamaseen is a wind that blows from the south in Egypt in spring, bringing sand and dust, and sometimes raises the temperature in the desert to more than 38 °C. A notable building to be seen here is the Abu el-Abbas el-Mursi Mosque, built in 1796 over the tomb of the 13th century holy man Abu el-Abbas, who is much revered in Alexandria.It is the most important historic mosque in Alexandria, Egypt, as well as a very beautiful one. The valley takes its name from the sumptuously furnished tombs constructed here for kings of the 18th, 19th and 20th Dynasties. In contrast to the pyramid tombs which had previously been favored, these tombs consist of a series of passages and chambers hewn from the rock. Like the chambers within the pyramids, these were intended only for the reception of the sarcophagus. Just north of the border between Egypt and Sudan lies the Aswan High Dam, a huge rockfill dam which captures the world's longest river, the Nile River, in the world's third largest reservoirs, Lake Nasser. The dam, known as Saad el Aali in Arabic, was completed in 1970 after ten years of work. The chief place in the Siwa Oasis is the little town of Siwa perched on a rocky hill. The ancient town was 2mi/3km west, at the village of Aghurmi. Only a few remains survive, apart from the conspicuous and well preserved Temple of Amasis, the presumed site of the oracle consulted by Alexander the Great. The Coptic Museum is a museum in Coptic Cairo, Egypt with the largest collection of Egyptian Christian artifacts in the world. It was founded by Marcus Simaika Pasha in 1910 to house Coptic antiquities. The museum traces the history of Christianity in Egypt from its beginnings to the present day. The Pyramids at Giza are among the best-known ancient monuments in the world and the only one of the Seven Wonders of the ancient world still standing. Of the three pyramids, the Great Pyramid of Khufu is the oldest and largest. The famous Sphinx stands in front of the Great Pyramid, with the body of a lion joined to the head of a man. The little Oasis of Farafra lies in latitude 27° north and longitude 28° east. Unlike the other Egyptian oases, it is not in a depression but on an apparently endless plain, surrounded by a sea of light colored limestone rocks. The 1,000 or so inhabitants live by cultivating dates, olives and citrus fruits. To the west of the Port Said is the great expanse of Lake Manzala, mainly consisting of marshland and reed beds, with great numbers of water birds. Manzaleh is a brackish lake, sometimes called a lagoon, in northeastern Egypt on the Nile Delta near Port Said and a few miles from the ancient ruins at Tanis. The Refectory is probably the oldest surviving building in the monastery. It is no longer in use, but the stone tables, benches and abbot's chair can still be seen. In the same building are the little Chapel of the Virgin, which is still in use, and the Library, which lost its oldest and most valuable contents as a result of the bedouin raid in 1483.